Over the last few days HFW has been awarded two major maritime industry awards: the Seatrade Middle East & Indian Subcontinent Maritime Law Award 2014 and the Lloyd's List Asia Maritime Lawyer of the Year Award 2014. 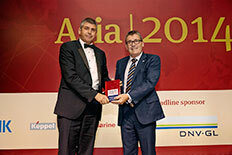 The Seatrade Middle East & Indian Subcontinent Maritime Awards were held on Monday 27 October at the Atlantis Hotel in Dubai and HFW were delighted to win the Maritime Law Award. Partners Hugh Brown, Simon Cartwright and Yaman Al Hawamdeh were there to collect the award on behalf of the firm. The award recognises the firm that has made the greatest contribution to the development of the maritime cluster in the Middle East. Partner Simon Cartwright said: "This award reflects the hard work and dedication of our wider maritime practice, which now spans six Partners and 13 fee earners. We are delighted to receive this recognition from our industry peers." In addition, at a gala evening on Thursday 30 October, HFW won the prestigious Lloyd's List Asia Maritime Lawyer of the Year 2014 Award at the Marina Bay Sands in Singapore. Partners Paul Apostolis, Dominic Johnson, Gareth Williams, George Lamplough, Richard Crump and Master Mariner Robert Spearing accepted the award on behalf of the firm. Making the award, which looks for exemplary expertise and commitment to the shipping industry, the judges recognised the firm's position as the region's leading marine practice. 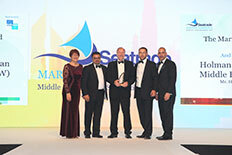 (L-R) Yaman Al Hawamdeh, Hugh Brown, Simon Cartwright accept HFW's Seatrade award. HFW's Global Senior Partner Richard Crump accepts the firm's Lloyd's List award. For more information, please contact Tania Phayre, Head of Marketing Communications, on +44 (0)20 7264 8546 or tania.phayre@hfw.com.